The basic principle of a tracer investigation is to label a substance or phase and then follow it through a system. Looking at tracer studies from a problem-solving point of view, if problems of fluid transport can be described in terms of ‘When?’, ‘Where to?’, and ‘How Much?’, then they can be solved by means of tracer techniques. The technology requires a number of sensitive detectors located externally in key areas of concern as well as the inlet and outlet of the vessel under investigation. A tracer material is injected into the process and if the material flows past a detector position it will register as a response versus time. 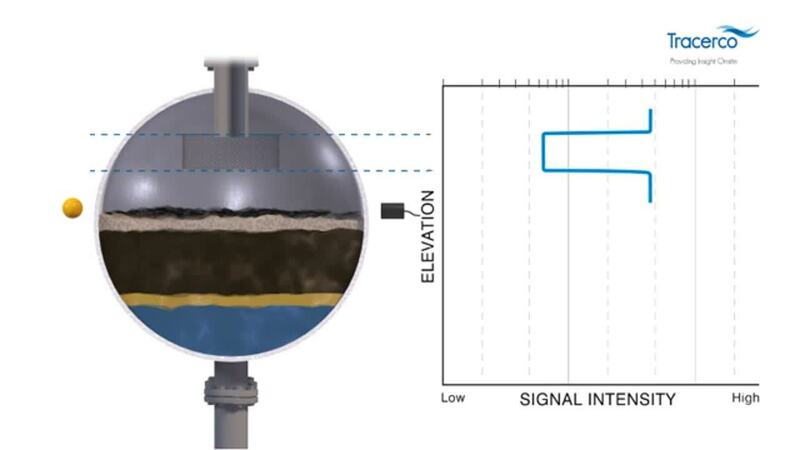 Analysis of each detector response provides information on flow distribution and timing allowing flow dynamics within the vessel to be determined. Using our proven tracer technology, Tracerco can also give you detailed data to help you analyse your separator’s performance and ensure efficient and safe operation. 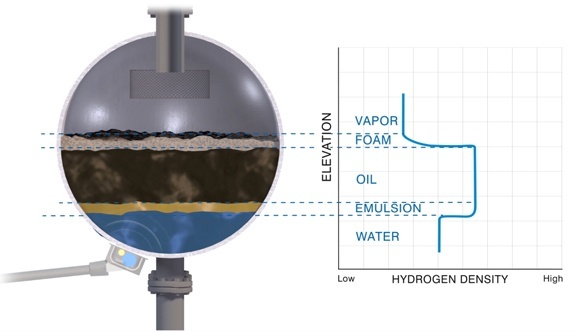 We can help you measure the residence time and distribution of fluid, the extent of any carryover or carry under, and assess flow characteristics. PhaseFinder™ Technology - The PhaseFinder™ technique is used to measure the height of each phase in the separator. This non-intrusive technology provides quick, accurate real time information on the amount of foam in your vessel, as well as the overall bulk level. This enables you to check your antifoam performance, and maximise the amount of fluid that passes through the separator. Tru-Scan™ Technology - Our safe, non-intrusive Tru-Scan™ technology provides accurate, real time information on the amount of foam in your vessel, as well as the overall bulk level. This enables you to check your antifoam performance, and maximise the amount of fluid that passes through the separator. By passing a source and detector down the sides of the separator, Tracerco can detect changes in the signal intensity. This indicates the overall bulk level. The same method can be used to check hardware inside the vessel. Our technology identifies missing or broken components, so you can plan for a shutdown and minimise downtime. In the video, Tru-Scan™ technology detects a change in signal intensity when it passes the demister. But when the demister is missing, there is no change in signal intensity.